More news about windows vista. Microsoft makes copying Vista a monster task With Windows XP, antipiracy measures were a bit of an afterthought. But with Windows Vista, Microsoft had pirates in its sights from the get-go. Apple Adds Vista Support to Boot Camp Apple on Wednesday pushed an update to its Boot Camp dual booting feature, providing support for the 32-bit version of Windows Vista, as well as updated drivers for various hardware included with Intel Macs. Update on Microsoft Security Advisory 935423 Little more info from Microsoft on the Windows animated cursor vulnerability, how long they have known, time of the first attack, how they are fixing it, etc. Microsoft: Rise in attacks on Vista loophole Just a day after release, the vulnerability in the ani files has caused hackers to pick up the pace on their attacks on some versions of Windows. Windows Vista Update Solves IPod Issues Microsoft patched a bunch of bugs earlier this week, including the one involving the iPod. Grab the update here. 3 reasons Vista lets down gamers Hardware incompatibilities, backward incompatibility and lack of directX 10 games, visit the site for details. 3rd Party Patches Critical Windows Flaw Not content to wait for Microsoft to remedy the issue, independent security firm eEye released a temporary patch for a critical flaw affecting Windows that can lead to a crash-restart-crash loop. But Microsoft does not recommend such third-party patches. Windows Vista ATI Radeon Kernel Mode Driver Denial of Service A weakness has been reported in Windows Vista, which can be exploited by malicious, local users to cause a DoS (Denial of Service). Living With Vista: First 30 Days With the new version of Windows finally out, early users say they’re bedeviled by hardware and software problems–but some love the OS anyway. After taking much criticism of their latest product, the Zune Media Player, this week Microsoft spoke up about some of their plans for Zune and how this year is just a beachhead, or first landing, so to speak. They expect to sell 1 million players be the end of the fiscal year, June 2007, which would give them somewhere between 10 to 20 percent of the market currently enjoyed by the Apple iPod, which is not too bad of a first year. They also mention that some of the features that they don’t have compared to the iPod are ones that most users don’t use much, and are ones that they will be adding as time goes on. Assuming that happens, Zune isn’t a total wash, as the number one non-iPod product in the over-$200 MP3 player market during last year’s holiday season only sold a tiny fraction of that amount. It’s also worth nothing that Zune went from the first whiteboard scribbles to finished product in about 10 months, a monumental feat for a company that isn’t particularly well know for moving quickly. The key to Microsoft’s decision to make the Zune, I was told, is that while Apple controls 75 to 80 percent of the overall market for MP3 players, Apple completely controls the only parts of the market that make money (i.e. large capacity MP3 players). For all of its work creating the underlying technologies for the PlaysForSure initiative, Microsoft watched as its numerous hardware partners, collectively, managed only to steal tiny amounts of share in the low-end flash memory player part of the business. This is not a sustainable business model, I was told. They plan to launch and ship many updates for the Zune player and will be adding new devices with more unique features. They are currently readying the first update for some bug fixes and things current users will appreciate, but this update does not contain any new features, especially the one everyone wants, more WiFi stuff baby. Microsoft is also readying its first software update for the Zune. The update will allow the Zune to work with Windows Vista, Microsoft’s just-finished operating system, which is now available to businesses and goes on sale to consumers in January. Bill Gates said they are just going to do media, they are going to do more, and they expect to spend several hundred million dollars to develop and market the Zune Media Player. Microsoft and Universal Strike a Deal, Who is Next? Microsoft and Universal have signed an agreement that says Universal gets over $1 per Zune sold in exchange for licensing its recordings to Microsoft’s new digital music service. This is huge. Apple has no deals with recording companies like this, Apple only pays them for songs sold through iTunes. This will definitely affect any future deals they have with these companies, companies like Universal had no idea that billions would be made from the iPod when they signed their deals with Apple, so they will want a cut of anything going forward, and I can’t imagine Apple not having to pony some more money up, if they loose tracks in iTunes, they may loose customers to Microsoft and their Zune player. Universal Music, a unit of Vivendi, will receive a royalty on the Zune player in exchange for licensing its recordings for Microsoft?s new digital music service, the companies said. Sounds like he is saying we are all pirates and they deserve a cut. I say, lots of us pay for the cd’s and expect to be able to do with them what we want, they are our property after all. If the music companies didn’t point as many fingers as they did and sue as many people as they did, maybe everyone would feel a little different about them. I don’t remember recording songs from radio stations being frowned upon, but it is a lot easier nowadays for one song or album to make its way around the world. Jon Lech Johansen, also known as “DVD Jon,” says he has cracked the playback restrictions put in place by Apple on their iPod mp3 players, and says an unnamed client will soon use his technology so that it’s copy-protected content will be playable on iPods. He says his lawyers have given him the green light to go ahead and that while Apple can give them some trouble, they cannot stop this. A hacker known for cracking the copy-protection technology in DVDs claims to have unlocked the playback restrictions of Apple Computer Inc.’s iPod and iTunes music products and plans to license his code to others. While his lawyers are giving him the green light, he will surely be sued by Apple in an attempt to block it. Fred von Lohmann, a staff attorney at the privacy-advocacy group, Electronic Frontier Foundation, said Johansen is treading carefully this time, but isn’t necessarily cleared from a legal fight over copy-protection laws. Saying, “There is a lot of untested legal ground surrounding reverse engineering.” Which is an understatement, I’m sure. Johansen first rose to fame when he wrote DeCSS, to unlock the content scrambling system used by the film industry to prevent copying, he was charged with data break-in but was soon acquitted. He has been a hacker folk hero ever since. Saw this interesting post on Techcrunch talking about rumor they posted on Crunchgear, that says, if you share a song with your Zune, and that person buys it, you get credit back, which you can then use on the Zune Marketplace. So, if you and all of your friends get a Zune, why not be the first to share the songs and get some credit for spreading the love. We know that the zinger for the Zune is the social networking/music sharing features. Briefly, it works thusly: if we have a song on my Zune we like, we can send it to your Zune via WiFi. You can listen to the song three times for free within a 3 day window, then it will prompt you to pay for it ($1), lest it disables itself. If you do pay for the song we shared with you, then we would get a credit for turning you onto the song. Once we have enough credits, we can cash them in for free songs or other items from the Zune Marketplace. So it suits us to share, share, share. It?s sort of a backwards pyramid marketing scheme. No information on how many credits you need to buy a song, but this will surely help Microsoft grab some market share from Apple, these are some features users definitely want, being able to share files on your wireless connection sounds great, to bad it only allows you to play them for three days. I expect some enterprising young individual to crack it and allow you to be able to share all your files for as long as you want, but I have been wrong before. 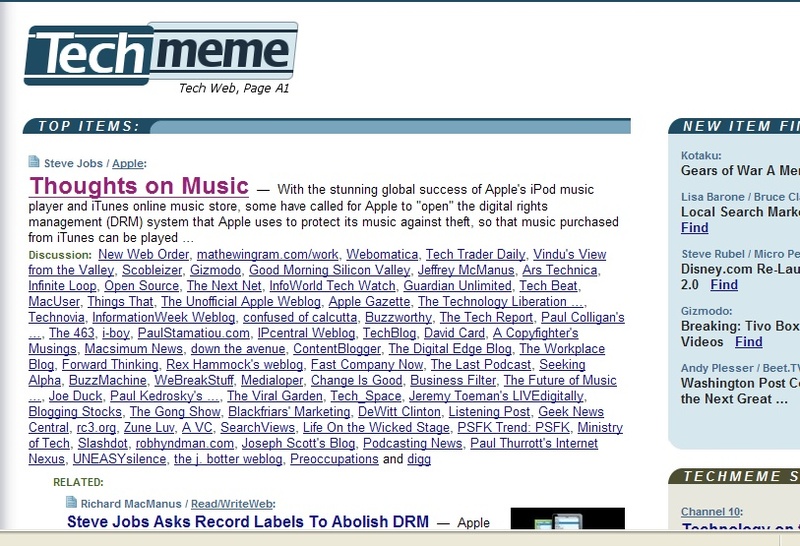 Clearly the goal here is to create a bit of viral marketing for music and, as an added bonus, drive sales on the IZMS. As we look into the Zune more closely, it seems the MS team might have just hit on the iPod killing factors that most MP3 players have been missing thus far, although we’re still fairly excited about the touch screen iPod rumored for this year. Perhaps a Zune/TouchPod Thunder Dome is in order, with the Zune flinging DRMed pig waste at the iPod while Steve Jobs and Bill Gates act as Master and Blaster, respectively. Melinda can be Aunt Entity. If you have lost your well maintained, black, 30gb, iPod, then David Berlind is looking for you. Check out this little gadget from irecord, you plug it into your audio/video system and record directly to your USB storage device, such as your iPod, or jump drive. So, you could record your favorite TV shows, cd’s or dvd’s straight to your Video iPod. The device is only $199.99. iRecord uses patent-pending compression techniques to give you 3 hours of video/audio recording per Gigabyte of storage using H.264/AVC for video encoding and AAC for audio encoding. Music only recording is supported by MP3 audio compression to be compatible with a wide variety of MP3 players. Who is the “Father” of the iPod? According to an article at Wired, its not Steve Jobs, it was a bunch of people, inlcuding Steve jobs. One of these myths is that the iPod has a father — one man who conceived and nurtured the iconic device. Steve Jobs, of course, is one candidate; but engineer Tony Fadell has also been named the father of the iPod, as has Jon Rubinstein, the former head of Apple’s hardware division. While they all played key roles in the iPod’s development, the iPod was truly a team effort. It’s a good read, a must for Apple fans.